Have lots of old jeans? Old shirts? Put them to good use! 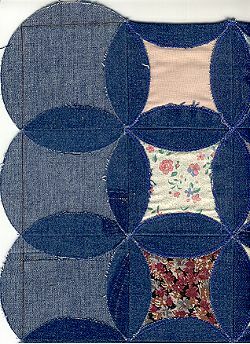 This tutorial will show you how to make a fun quilt out of your well-loved clothes.
" From the front it reminds me of a Cathedral Windows Quilt." "Just for gee-whiz information, the majority of the prints that showed in the front side of the scan were from fabric scraps my mom had given me a long time ago. I just wanted to use them up rather than throw out. 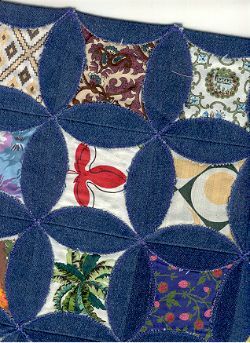 They were pretty old pieces of fabric in this circle quilt. Most were from shirts my dad or my brothers wore when I was little."